Cameron was born in 1980 and became interested in playing the organ at the age of 11 when his parents bought him a Wurlitzer electronic organ. He decided that he would teach himself to play and so has never had any lessons! After a visit to the Tower Ballroom Blackpool at the age of 12, he really became hooked on the theatre organ and dreamed of playing at the world famous Blackpool Tower Wurlitzer. Whilst attending a concert at Wolverhampton Civic Hall in 1998, he was fortunate enough to have a go on the Compton Organ installed there. As a result he was encouraged by the Wolverhampton City Organist, Steve Tovey and was allowed to practise at the Civic Hall. His dream came true in 1999 when he was invited to play the Blackpool Tower Wurlitzer. Since then he has been back four times! During 2001 and 2002, he played the Compton regularly at The Kinema in the Woods, Lincolnshire, occasionally accompanying silent films. He also attended two COS workshops with David Lowe during which he gained valuable insight into technique. 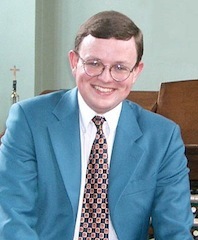 He is currently the resident organist playing the ‘Cannock Wurlitzer’ and also at the Grange in Hednesford on a 3/7 Compton. Cameron now plays at the Civic Hall Wolverhampton as Assistant Organist for dancing as well as other occasions such as the Ken Dodd show (three years) and with Todd Miller and the Joe Loss Orchestra (four years). He has now played for five Mayors. The majority of his time is spent traveling around the country playing for Ballroom and Sequence dancing using his trusty Yamaha EL 70. Cameron says that there is plenty of work out there for the dance organist and he now plays full time. For three years he has played for the British Association of Teachers of Dancing at their annual conference. Cameron also plays the Abbey Hall Compton organ regularly for dancing.